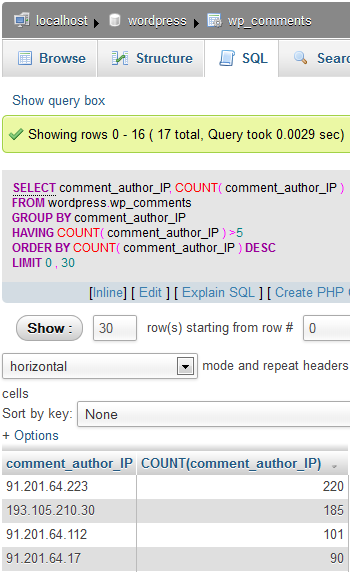 In this article we'll discuss an even more advanced method for cleaning up spam comments from your WordPress database using phpMyAdmin. If you followed along with our 320: WordPress comment spam clean up article this would be one of the more advanced methods mentioned in that article. 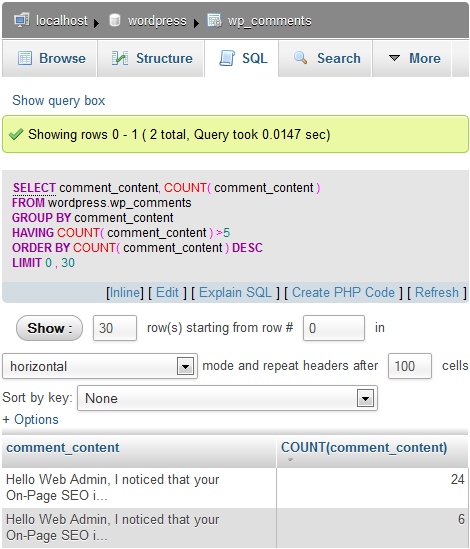 The previous article 321: WordPress advanced comment spam clean up with search explained another advanced way of cleaning up spam from the database. The method discussed in this article can be used in conjunction with those steps in order to clean things up even better. 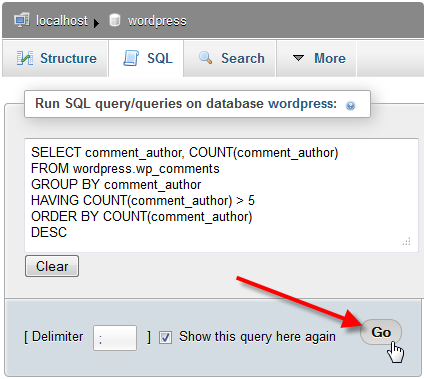 First you'll need to get to your WordPress database via the phpMyAdmin interface. Enter in the following query, then press Go. 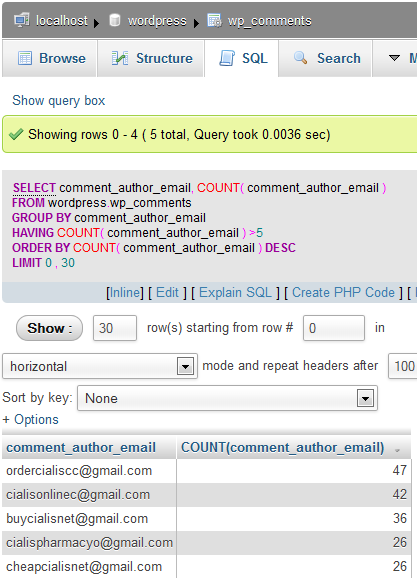 You'll want to adjust this query specific to your WordPress database and table prefix. 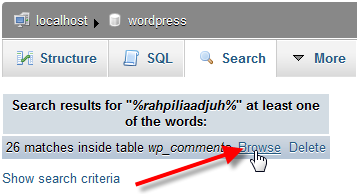 In this example our database name is simply wordpress, and our table prefix is wp_. Selects the comment_author row and counts each entry. Sets the database and table we're selecting from. Groups our selection by the comment_author row. Only select entries that have 5 or more duplicate entries. Order the results by the number of duplicate entries. Sort our entries descending, showing largest entries first. 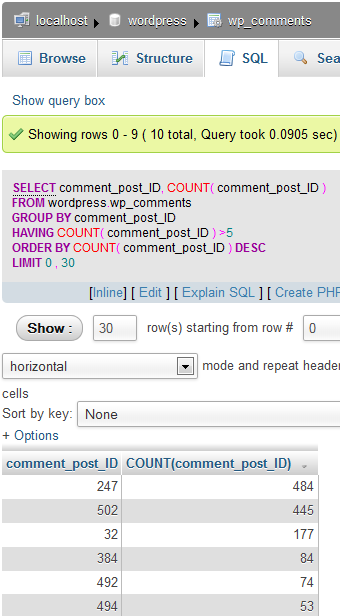 Copy (Ctrl-C) the text of the comment_author entry with the most duplicate entries. 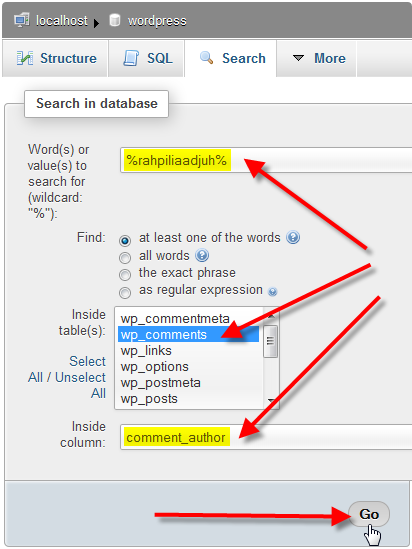 In the first field Word(s) or value(s) to search for: paste (Ctrl-v) your copied text. Place % symbols in-front and behind of the text for wildcards, now any entry containing the word at all will display. 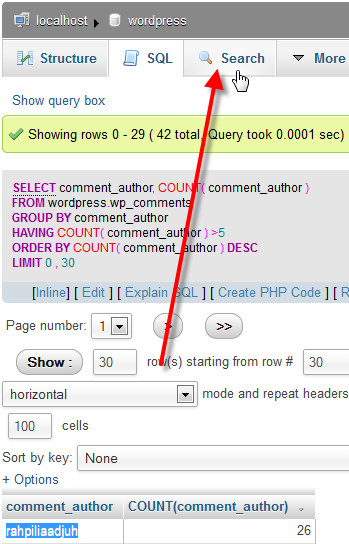 In the Inside table(s): menu click on wp_comments to only search within that table. Next to the Inside column: field enter in comment_author, then finally click Go. 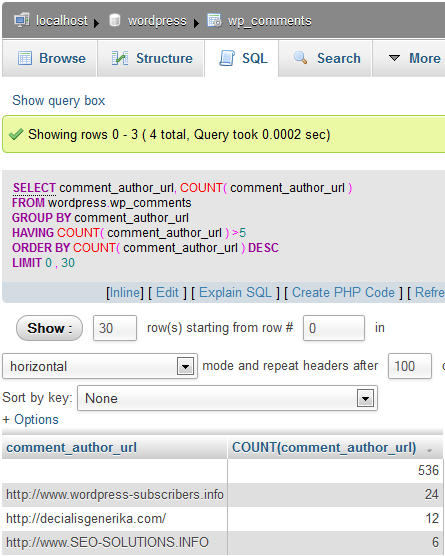 Now you can review the comment_content row for that user to determine if it's all spam content. In this case all comments were spam, so scroll to the bottom and click on Check All. If not all of the comments were spam, you can simply place a checkmark beside the ones that you wish to remove. 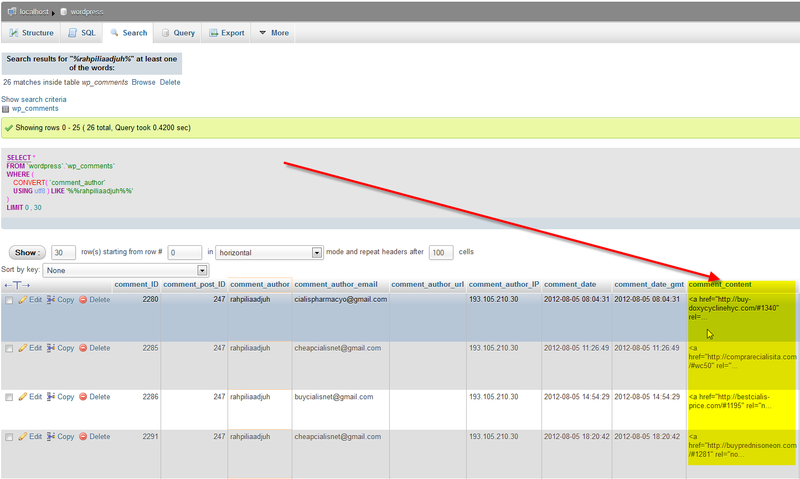 Then click on Delete at the bottom of the page. 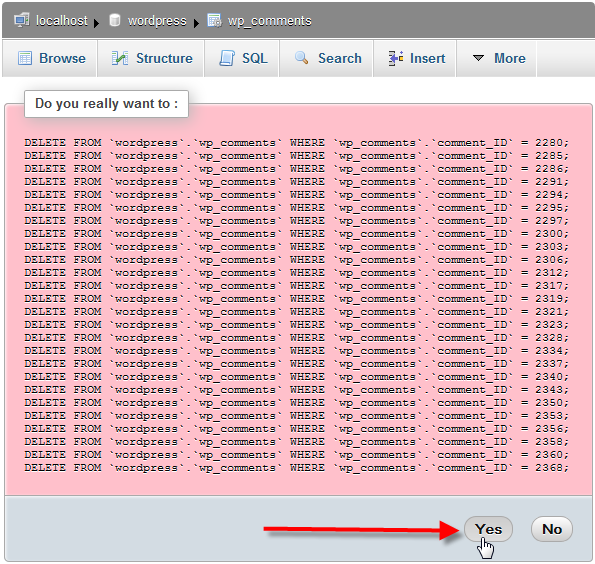 Confirm your deletions by clicking on Yes. MySQL should now return an empty result set if the deletion was successful. Section 45: 323: WordPress: "Briefly unavailable for scheduled maintenance"